Despite Medway Council’s Housing Register showing that nearly 19,000 households are looking for housing in the area, it appears 65 nesting pairs of nightingales have further delayed plans to build up to 5,000 new homes at Lodge Hill. Natural England, the government’s conservation agency, has dealt a body blow to ambitious plans to create housing - along with community facilities and new employment opportunities - on the site of the former MoD Chattenden Barracks after designating it a Site of Special Scientific Interest (SSSI). 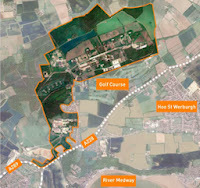 Land at Lodge Hill had been earmarked for development by Defence Infrastructure Organisation, with Land Securities selected as Land Sale Delivery Partner. However, Natural England’s SSSI designation for the area’s nightingale population, as well as for species of special grassland and woodland, marks the final step in the designation process after Lodge Hill was notified in March this year. One possible way forward, and one already suggested before Natural England’s decision, may be to offset the Medway land and create a new ‘watch of nightingales’ across the Thames in Essex. Despite the NPPF predisposition in favour of approval on the grounds of economic growth, and the support of the democratically elected local authority and community, Lodge Hill highlights the complexities of the planning regime for developers and for economic growth. Kentcentric understands that Natural England’s decision does not determine whether or not development can go ahead, as this remains a matter for the planning system. We’d be happy to hear from planning experts as to what might happen next.